Methicillin-resistant Staphylococcus aureus (MRSA) is type of staph infection that has developed a resistance to antibiotics commonly used to treat ordinary staph infections. Because MRSA is antibiotic-resistant, there are misconceptions about whether it is treatable or not. And although it can be difficult to treat, treatment options are still available and are typically highly effective. Most MRSA infections are not serious, however, some can be life-threatening. Being able to recognize the symptoms of MRSA is the first step to receiving effective treatment and prevent complications. Staph infections like MRSA typically start as small red bumps that look like pimples or boils on the skin. These bumps can then become deep and painful, often red, swollen, and filled with pus. If you notice a bump on your skin has become painful and pus-filled, it is important to seek medical attention as soon as possible. Attempting to drain or treat the infection yourself could result in complications or spread of the infection to others. If improperly treated or left untreated, MRSA infections can lead to complications such as infections in your bloodstream, lungs, heart, bones, and joints. MRSA can be difficult to treat, but not impossible. 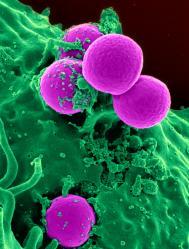 MRSA is resistant to some antibiotics, but it is not resistant to all antibiotics. Sometimes antibiotics are not necessary to treat MRSA. Your medical professional may be able to safely make an incision and drain the infection completely. If a medical professional prescribes you antibiotics for MRSA, it is important to take your prescription as directed. Even if the infection looks better, stopping antibiotics too early can allow for staph bacteria to survive and become resistant to the antibiotic and reinfect you or another person. If you are experiencing the symptoms of MRSA, don’t wait to see a medical professional. FastMed is open 7 days a week, 365 days a year, and you don’t need an appointment to be seen. With multiple locations right in your neighborhood, FastMed makes it easy for you to receive the treatment you need when you need it most.